click on the images to magnify them-............click on this symbol beside the video fields to get to the youtube- website an watch videos in original size . map with registered earthquakes in 2010 in the region of the Canary islands. click on the graphic to enlarge. NEW! internal concept of a new Earthquake map! Click on image to get to my interactive map . Click on the "spot images" there to receive further informations on specific Earthquakes! first report: Las vegas "SUN"
FEB- 07- 2010 Earth directed CME Sun after M6 flare full CME (solen.info) (solen.info)February 7: A full halo CME was observed following an M6 flare in region 11045. 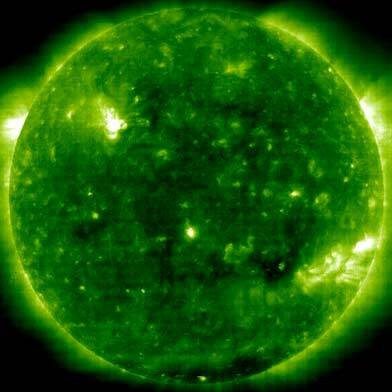 Feb- 06-2010 Earth directed CME Sun after M2 flare partical CME solen.info: solen.info: A CME was observed off of the east limb after an M2 flare in region 11045. Feb- 28-2011 Earth directed CME Sun after M6 flare partial CME solen.info A backsided northern hemisphere filament eruption was the likely source of a CME observed starting in LASCO C3 images at 16:42 UTC on Feb.28. March- 06-2011 Earth directed CME Sun after M6 flare partial CME solen.info A filament eruption near S755 at 05:30 UTC on March 6 was the origin of a CME observed off of most of the east limb. There's a slight possibility that the outer edges of the CME could reach Earth on March 9 and cause a minor disturbance. solen.info A recurrent coronal hole (CH398) in the northern hemisphere will likely rotate into an Earth facing position on April 3. A CME was observed in STEREO-A images after the M2 flare in region 11081. Too few images are currently available to forecast whether or not this CME could have any influence on the geomagnetic field. Please note. From August-04 on, I will use the earthquake database of theEuropean institute CSEM/ EMSC. The reason is:. They provide better maps and keep the data bases of the single earthquake events. low magnitude Earthquake which caused signficant damage in Christchurch-NZ. Report was sent only yesterday in German N24 TV. map with all registered cearthquakes in 2010 for region: Canary islands.